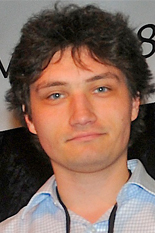 Mechanical Engineering graduate student Ivan Penskiy has been awarded a 2015-2016 University of Maryland Graduate Dean’s Dissertation Fellowship. Out of the 4,000 graduate students studying at Maryland, the Graduate Dean's Office selects only 10 students for this award. Penskiy is a Ph.D. student working under the mentorship of faculty advisor Associate Professor Sarah Bergbreiter, and is performing research in the development of microscale motors using microelectromechanical systems (MEMS) technologies for millirobotics applications. His thesis is on "Small-Scale Actuated Mechanisms for Millirobotics Applications." "The Graduate Dean’s Dissertation Fellowship will allow me to dedicate more time to research," said Penkiy. "The fellowship will also create more room in my advisor's budget for conference travel, so I will be able to present different aspects of my dissertation research and showcase the accomplishments of the Microrobotics Lab." The Graduate Dean's Fellowship carries a $25,000 stipend, candidacy tuition award and a credit for mandatory fees for the Fall and Spring semesters. This award enables recipients to devote full attention to the research, scholarly or creative work directly related to their dissertations.